Dimension specialty herbicide is the leading turf and ornamental product for preemergence and early postemergence crabgrass control. 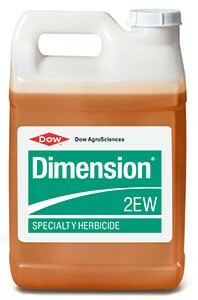 Applied early or late in the season, Dimension eliminates the need to switch products after crabgrass has germinated. This longer window gives you more application flexibility during your busy spring season. It also is effective on 45 other tough-to-control grassy and broadleaf weeds found in turf and ornamental settings, making it an ideal border-to-border solution. Available in multiple formulations, Dimension won’t leave turf, equipment or surroundings stained yellow.